The Silk Road has more than 2,000 years of history and now the famous travel route known as Silk Road tour. It began in Chang’an (present Xi’an, Shaanxi Province) in the east and stretched to Rome, Italy in the west. The route crosses Shaanxi, Gansu, Qinghai provinces, Ningxia Hui and Xinjiang Uygur autonomous regions and then passes over the Pamirs, to extend to Central and West Asia and finally reaches the east bank of the Mediterranean Sea and Eastern Europe. The total length of the Silk Road is more than 2,485 miles, over half of the width of China. The Silk Road was the main artery for business and trade between China and the West. It has played an important role in the exchanges of cultural and trade-goods. As many people already know, China’s four major contributions to civilization are papermaking, printing, compass and gunpowder. They were introduced to Western countries via the Silk Road. In return, many aspects of Western civilization that influenced Chinese society made their way back along this road. The Silk Road has been an indispensable instrument in the opening up and developing of cross-cultural friendship. Although modern society is no longer dependent upon this ancient and time consuming method of interaction, the history and spirit of the Silk Road are still a dream sought by tourists either from the East or the West for the impressive top 10 China tours. Along the Chinese section of the Silk Road, there are numerous famous historic and cultural sites. 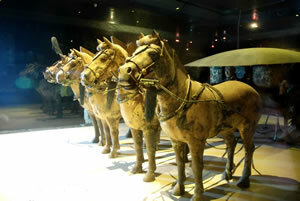 The best known is in Xi’an, where the life-sized Terra-cotta Warriors and Horses were excavated from sites near the tomb of Emperor Qin Shi Huang, known as the eighth wonder of the world. Of the countless other attractions, there are also Dunhuang’s Mogao Grottoes, sometimes called an “Oriental Art Treasure”. Loulan was an ancient state in the desert and houses the Ruins of the Ancient City of Gaochang. The road also goes through unique and magnificent natural surroundings, such as Flaming Mountains and Grape Valley in Turpan City, Yadan Landform in Lop Nor, Birds Island in Qinghai Lake and Tianchi Lake on Tianshan Mountain. These places are very attractive to visitors for your China vacation deals. In some areas along the Silk Road, there are many ethnic minorities, including Uygur, Hazak and Tajik people. They have great hospitality and unique traditional cultures, life styles, religious beliefs, songs and dances. They add another dimension to the charm of the Silk Road. When the central government began developing West China, they realized the tourist resources in these regions were endless. The various tourist facilities in the locality are improving day by day, and there have been significant advances in communications. As a result, the Silk Road has become one of the most attractive theme routes making contribution to China tourism. Urumqi (Wulumuqi), situated on the northern slope of the Tianshan Mountains is most famous for being the furthest city in the world from the ocean and major destination for Silk Road travel. A relatively new city (founded in 1763), the most land locked area in the world is essentially a modern and drab place, resembling a Russian industrial town in many ways,? with few sights of interest but a lively resident population who sustain enough intrigue to hold you here for a day or two. This is also a compulsory stop in terms of transportation (and has been since the Silk Road opened) throughout Xinjiang, and the spectacular Heaven’s lake, a day trip from the city, justifies a visit to this area in itself. Previously known as Dihua, meaning “Enlightening and Civilizing”, the Chinese renamed the city in 1884 to its present day tag, Wulumuqi. Although the feeling and atmosphere here is predominantly Uigur, in fact, 80% of the population are Han Chinese. Long an important trading center, the Han Chinese population today dominate the industrial and commercial side of the city, with huge department stores and factories ruling the skyline here. An exploration of the older streets and the Uigur area known as Erdaoqiao provides a more interesting look at the different nationalities living in the city. One thing to bear in mind here is the time! Although officially run according to Beijing time, residents actually live life two hours behind Beijing. This does not however, affect train, plane and bus times, so make sure you are absolutely sure when you are supposed to leave and which time zone is being used! The Heavenly Lake (Tianchi Lake) is situated to the east of the Tianshan Mountain range, north of Bogda Peak, 97 km south of Urumuqi. Known as Yaochi in ancient times, the lake surface elevates 1,910 meters above sea level, with an average depth of 60 meters. Surrounding the Heavenly Lake are snow mountains, glacier forests and grassland alpine lakes, featuring a? vertical natural landscape belt. The snow line of Mt. Bogda is 3,860 meters above sea level, making it rich in glacier resource. Numerous super-glacial rivers formed by the melting snow and ice, ice bridges, ice mushrooms and ice fountains can be seen on the glaciers. There are many super-glacial lakes and moraine lakes scattered in front of the glaciers. The vast expanse of mountain land and forests at the foot of Mount Bogada are also rich in plant and animal resources. In summer, the beautiful lake is an ideal cool resort. 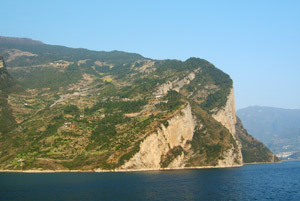 Boaters on the lake see the ever-changing silvery mountains soaring into the blue sky, their slopes highlighted with verdant pasture and flamboyant wild flowers. Fishing at dusk has its own special charm. A day in this fairyland promises restoration. Heavenly Lake, a relic of the Quaternary Period Glacier and its surrounding geological relics, offers science lovers exploring opportunities. As if the natural beauty of Heavenly Lake were not enough, legend adds a mysterious touch. It is said that the West Queen (Xi Wang Mu) entertained King Mu of the Western Zhou Dynasty (1100B.C.-771B.C.) at the Lake. The West Queen fell in love with the king and asked him in her poem, ‘The white clouds drift while the mountains reach the blue sky. Passing thousands of mountains, crossing ten thousands of rivers, you come to us from a faraway place. If you are still strong and fine, would you like to come back to us again?’ The king answered in his poem, ‘After I go back to central China and lead the people to a prosperous life, I will come to you again. We do not know why the king never returned. Only the placid lake and the silent mountains witnessed the lovesickness of the West Queen. Towards the south of Urumqi City, the Nanshan Pasture is located in Kelawucheng Mountain, a branch of north Heavenly Mountain which is the good place for cool summer China travel deals. Moreover, there are numerous valleys in the pasture. It is cool here in the summer, and is a good place to get away from the heat.The pasture is a fertile place with charming mountains around. Among the mountains, White Willow Ditch is a unique, graceful peak standing side by side with snow on tops all year round.Springs flowing in the deep valleys, horses running on the green field and you can see livestock scatters here and there. This is a natural pasture.Besides the animal husbandry, the pasture also has great many tourist attractions. You can ride on horse or camel running through the valleys, walk across the woods picking mushrooms and enjoying the magical wild flowers, and climb up the mountain looking out. You can really enjoy the panorama views everywhere that you look.The below the White Willow Ditch is very cool with dense woods. There’re 40 meters high and 2 meters wide waterfall flows from the top of the mountain, this fall makes a great deal of fog. Being a tourist, you may be interested in this view: when the sun were above the fall it creates a rain. On the east side of the White Willow Ditch, which is on the other side of Wuku highway? Although it is not as beautiful as the west, we can find its attraction from the quietness.Climbing up the east White Willow Ditch, you will find a great peak standing ahead, this is the highest peak of the pasture: Shengli Daba. It is also called “a glacier kingdom”. Running across the snowy glacier is like a trip in a crystal palace. If you are going up along the Gan Ditch, you will finally arrive at Chrysanthemum terrace. This is an endless terrace; with a great many unknowns flower and grass. Their wonderful smell attracts groups of butterflies and bees. The plants and the insects make the terrace look like a giant outdoor garden.This is a complex of natural pasture and giant outdoor garden. When you arrive, you will feel like going into a heavenly scenic that helps you to forget all the annoying things of daily life. It is also a great place to spend the summer holidays for escaping the heat. The Xinjiang Regional Museum is a large integrated museum and center for the collection and study of cultural relics in Xinjiang. With 10 halls and nearly 50,000 items, it is a must for Silk Road (now it is the famous travel route for your popular China tour package) aficionados. The highlight is the locally famous ‘Loulan Beauty’ of Indo-European ancestry, one of the desert-mummified bodies that became a Uighur independence symbol in the 1990s. Other exhibits include Buddhist frescoes from the Kizil Thousand Buddha Caves and an introduction to all of the province’s minorities. It covers a total area of 100,000 square meters, largest bazaar in the world. with a strong flavor of Islamic architecture, the Bazaar represents the bustling scene of ancient silk road with various goods trading and different cultures exchanging. Now, it still functions in this way. 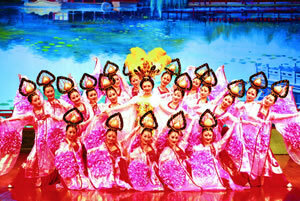 As a window of Xinjiang, you can find and experience the real local residents’ life. meanwile, a window of the world, here you can taste a kind of exotic flavour. For more others, you can check out China tour guide.